Publications are arranged in the decreasing order of the Indian Foundation for Butterflies Publication Numbers. 16. Nitin, R., A. Sengupta, and K. Kunte. 2018. Butterflies of Bengaluru. 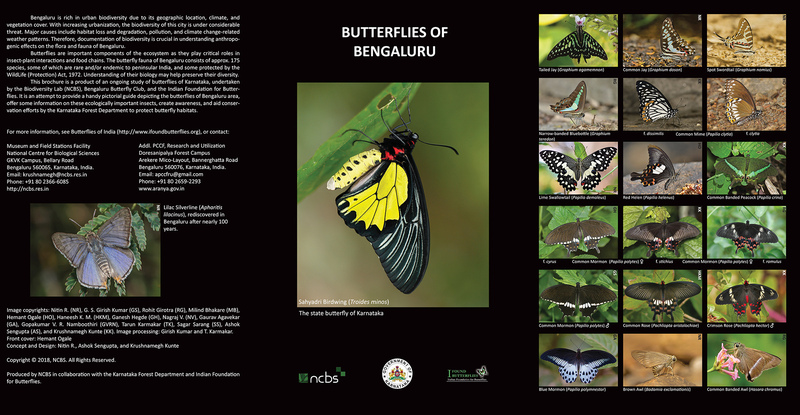 A brochure produced by the National Centre for Biological Sciences, in collaboration with the Karnataka Forest Department and Indian Foundation for Butterflies. Download a sample (1MB). 15. Nitin, R., V. C. Balakrishnan, P. V. Churi, S. Kalesh, S. Prakash, and K. Kunte. 2018. Larval host plants of the butterflies of the Western Ghats, India. Journal of Threatened Taxa, 10:11495–11550. PDF file (1.3MB, includes a corrigendum). 14. Sondhi, S., and K. Kunte. 2018. Butterflies of Uttarakhand. Bishen Singh Mahendra Pal Singh (Dehradun), Titli Trust (Dehradun), National Centre for Biological Sciences (Bengaluru), and Indian Foundation for Butterflies (Bengaluru). x+310pp, all in full color. 13. Sondhi, S., and K. Kunte. 2018. Butterflies and Moths of Pakke Tiger Reserve (2nd edition). Titli Trust (Dehradun) and Indian Foundation for Butterflies (Bengaluru). 12. Sondhi, S., and K. Kunte. 2016. Butterflies (Lepidoptera) of the Kameng Protected Area Complex, western Arunachal Pradesh, India. Journal of Threatened Taxa, 8:9053–9124. PDF file (9MB, includes colour plates). 11. Sondhi, S., T. Karmakar, Y. Sondhi, R. Jhaveri, and K. Kunte. 2016. Re-discovery of Calinaga aborica Tytler, 1915 (Lepidoptera: Nymphalidae: Calinaginae) from Arunachal Pradesh, India. Journal of Threatened Taxa, 8:8618–8622. PDF file (4.7MB, has colour images of a type and other specimens). 10. Kunte, K. 2015. A new species of Hypolycaena (Lepidoptera: Lycaenidae) from Arunachal Pradesh, north-eastern India. The Journal of Research on the Lepidoptera, 48:21–27. PDF file (3.8MB, has colour images of the types and other specimens). See the press release or popular science coverage of this paper in The Hindu, The Telegraph, National Geographic Traveller India and Times of India, among many others. 9. Kiran C. G., S. Kalesh, and K. Kunte. 2015. A new species of damselfly, Protosticta ponmudiensis (Odonata: Zygoptera: Platystictidae) from Ponmudi Hills in the Western Ghats of India. Journal of Threatened Taxa, 7:7146–7151. PDF file (2MB, has colour images). 8. Sondhi, S., and K. Kunte. 2014. Butterflies and Moths of Pakke Tiger Reserve. Titli Trust (Dehradun) and Indian Foundation for Butterflies (Bengaluru). vi+202pp, all in full color. 7. Kunte, K., S. Sondhi, G. Agavekar, R. Lovalekar & K. Tokekar. 2013. Final notes on the identification and misidentification of butterflies of the Garo Hills. Journal of Threatened Taxa, 5:5019–5020. PDF file (3.4MB, has color images). 6. Kunte, K., G. Agavekar, S. Sondhi, R. Lovalekar & K. Tokekar. 2013. On the identification and misidentification of butterflies of the Garo Hills. Journal of Threatened Taxa, 5:4616–4620. PDF file (3.4MB, has color images). 5. Sondhi, S., K. Kunte, G. Agavekar, R. Lovalekar, K. Tokekar. 2013. Butterflies of the Garo Hills. Samrakshan Trust, Titli Trust and Indian Foundation for Butterflies. pp. xvi+200. 4. S. Rai, K. D. Bhutia and K. Kunte. 2012. Recent sightings of two very rare butterflies, Lethe margaritae Elwes, 1882 and Neptis nycteus de Nicéville, 1890, from Sikkim, Eastern Himalaya, India. Journal of Threatened Taxa, 4:3319–3326. PDF file (5MB, has color maps and figures). 3. Kunte, K., S. Sondhi, B. M. Sangma, R. Lovalekar, K. Tokekar and G. Agavekar. 2012. Butterflies of the Garo Hills of Meghalaya, northeastern India: I. Their diversity and conservation. Journal of Threatened Taxa, 4(10):2933–2992. PDF file (8MB, has color map and 16 color plates). 2. Sarkar, V. K., D. S. Das, V. C. Balakrishnan and K. Kunte. 2011. Validation of the occurrence of Tajuria maculata, the Spotted Royal butterfly (Lepidoptera, Lycaenidae), in the Western Ghats, southwestern India, with two new records. Journal of Threatened Taxa, 3:1629–1632. PDF file (733KB, has color photographs and a map). 1. Lovalekar, R., G. Agavekar and K. Kunte. 2011. Spindasis abnormis, the endemic Abnormal Silverline butterfly of the Western Ghats, southwestern India (Lepidoptera, Lycaenidae). Parthenos, Jan. 2011:13–16. PDF file (246KB, has color photographs and a map). Kunte, K. 2019. Publications Of The Indian Foundation For Butterflies. In Kunte, K., S. Sondhi, and P. Roy (Chief Editors). Butterflies of India, v. 2.61. Indian Foundation for Butterflies.